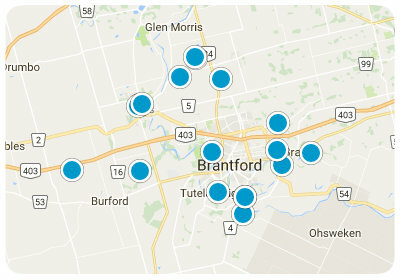 While driving west of the City of Brantford along Highway 53 you will come to the community of Burford, which is one of few communities in Ontario that can boast being over 220 years old. In fact, with its history dating back to 1793, Burford is one of the oldest cities in central southwestern Ontario and the oldest Euro-American settled community within the County of Brant. Burford has an approximate population of 1,615 residents, who are prideful of their tight-knit association and enjoy being part of such a wonderful community. In this rural town, local residents enjoy a large spectrum of activities. Each fall season, the city of Burford comes alive with the excitement and anticipation of the local fair. Hosted on the Burford fairgrounds, friends and families from all over the County of Brant gather to attend this festival and enjoy the rides, food and shows that the fair brings. Burford hosts its own golf course, Burford Golf Links, perfect for those who enjoy peaceful evenings relaxing and swinging clubs on the green. Burford is also home to the Burford Bulldogs, a junior hockey team that competes in the Southern Ontario Junior Hockey League. This is an excellent community for those homebuyers that appeal to slow-paced country living, and who appreciate the beauty of the rural landscapes that surround it. Beautifully tucked into the dreamy countryside, homes within the Burford community are extremely affordable and boast of their own charming character and flair. You can find a variety of gorgeous older homes in Burford, sure to impress you with their style and aged eloquence. Newly remodeled homes are also available in the community. With square footage anywhere from 1,000 to over 3,000 square feet families can comfortably get along in these homes. Burford is the perfect place for those who enjoy the abundance of natural beauty, peaceful ambiance, and country charm it has to offer. If you would like more information regarding homes for sale in Burford, please allow us to assist you and contact us today. 19.56 acre lot. Possible rezoning to put a residential lot site on the west side of the property. Mature trees, riding trails and a pond.